We just launched Python Data Science Toolbox (Part 1) taught by Hugo Bowne-Anderson! 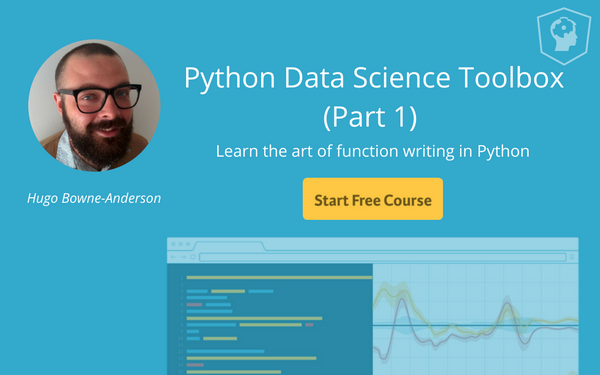 In this first part of the course, you'll learn the art of writing functions in Python. You'll come out of this course being able to write your own custom functions, complete with multiple parameters and multiple return values, along with default arguments and variable-length arguments. You'll gain insight into scoping in Python and be able to write lambda functions and handle errors in your very own function writing practice. So, what are you waiting for? Python Data Science Toolbox (Part 1) features 47 interactive exercises that combine high-quality video, in-browser coding, and gamification for an engaging learning experience that will get you on your way to being a Python function writing master. In the first chapter, Hugo covers how to write simple functions, as well as functions that accept multiple arguments and return multiple values. You'll also have the opportunity to apply these newfound skills to questions that commonly arise in Data Science contexts. [Start First Chapter For Free] The next chapter teaches you how to write functions with default arguments, so that the user doesn't always need to specify them, and variable-length arguments, so that they can pass to your functions an arbitrary number of arguments. The final chapter covers lambda functions, which allow you to write functions quickly and on-the-fly. Ready to get started?